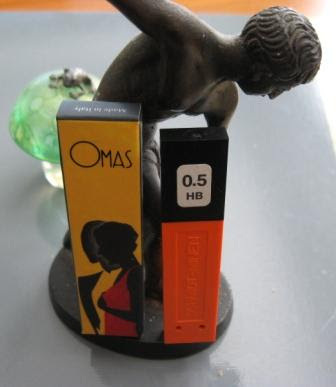 Omas are an Italian brand of luxury writing instruments. 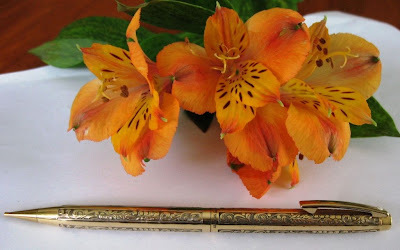 Like most luxury brands they place their emphasis on fountain pens, but they do offer a small number of instruments that write with lead rather than ink. I don’t have any Omas mechanical pencils, but I do have some of their leads. ……leads from Schmidt???? 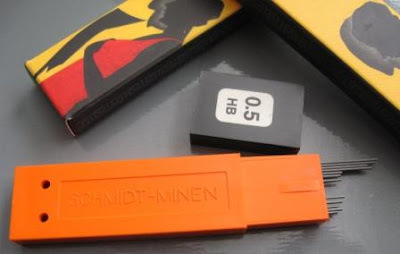 Many of you will know of Schmidt, the German manufacturer of writing instrument components. 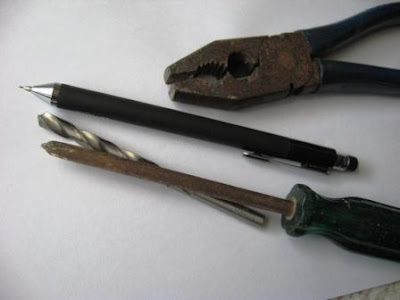 I don’t know if they make mechanical pencil leads themselves – I’ve always assumed they just bought them from a specialist lead manufacturer e.g. 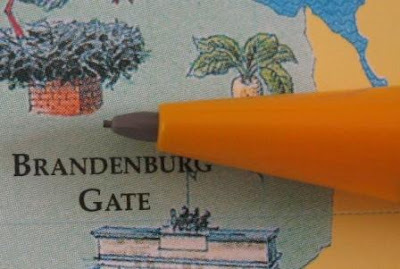 from their countrymen at Staedtler or Faber-Castell. 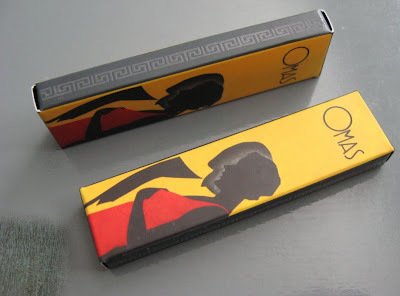 So what’s with the ‘Made in Italy’ tag on the Omas packages? 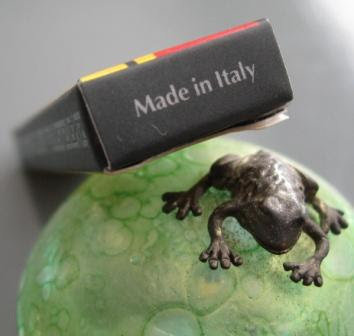 I’m surprised at the concept of there being a factory in Italy making mechanical pencil leads, but maybe there is one? Maybe the Omas package is misleading? 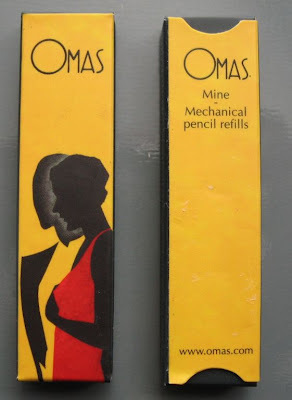 I am sure that wherever they are made, any lead associated with companies like Schmidt and Omas will be of good quality, but you certainly pay a lot to have it repackaged in Omas livery. Still, I’m happy with my purchase – those little packages really are classy. Back in early April “Jiahe” commented on my post “The Great Blue Challenge” that he had used Pilot Color Eno blue lead and that it had faded rather quickly. I was initially surprised at this, and my surprise turned to embarrassment when it was pointed out that the lead container carries a warning about fading, as shown below. Jiahe then challenged me to do some fade testing (or light fast testing) on the various blue leads that I had, and I reluctantly accepted. 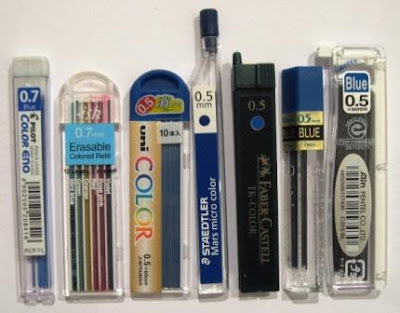 So, firstly, the blue leads that I have. “Sun” = taped up in a north facing glass window (remember I’m in the southern hemisphere) to get a good dose of sunlight throughout the day. The window glass is untinted and does not have any anti-UV or other treatments, but it is autumn so some days are nice and sunny, but others overcast or rainy. “Some” = put on the desk in my office at home. The blinds are mostly closed so there is not a lot of natural light. “Dark” = kept in a closed cupboard, no exposure to light, but exposed to the air. Yarrrrr???!!! Where has Pilot Color Eno gone? The “sun” exposure has completely faded and disappeared. At first I did a double take – did I forget to colour in that part? Had I aligned my three test-strips of paper incorrectly? If you look really hard you can see some remnants, but for all intents and purposes Color Eno has completely gone. The “some” exposure has had a little fading, though not much. There is a hint of fading on “sun” for Uni ~ish, but Uni Color has definitely changed. The “sun” exposure getting lighter and greyer, and “some” getting a little lighter. All the other samples are essentially unchanged. Well the sun has done for Uni Color and it’s a goneburger. 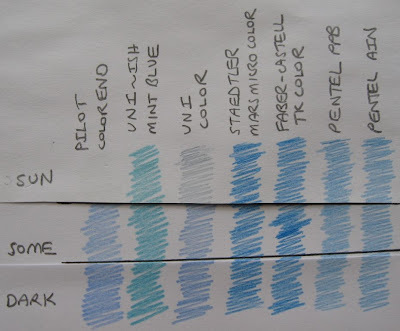 The “some” exposures for Pilot Color Eno and Uni Color are clearly starting to fade. Note that unlike Uni Color, Uni ~ish Mint Blue is holding up fairly well although the “sun” exposure is starting to show some fading. All the others are looking good. Basically more of the same. The “some” exposure for Pilot Color Eno appears to be on its last legs. Four of our blue leads showed little to no fading and have completed the lightfastness test with flying colours. Full marks to Staedtler Mars Micro Color, Faber-Castell TK Color, Pentel PPB and Pentel Ain. Fifth out of seven is Uni ~ish Mint Blue which has shown some fading for the ‘sun’ exposure, and a little fading for the ‘some’ exposure. Bringing up the rear, and a long way behind, are Uni Color and Pilot Color Eno. Pilot Color Eno 'sun' disappeared in week 1. 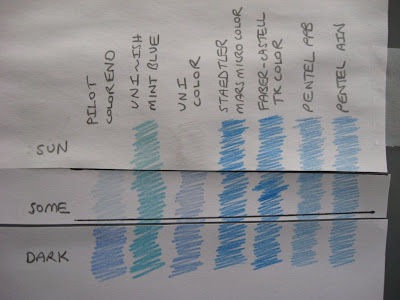 Perhaps you artists out there can tell me of some use for special disappearing blue leads. Secret agents? 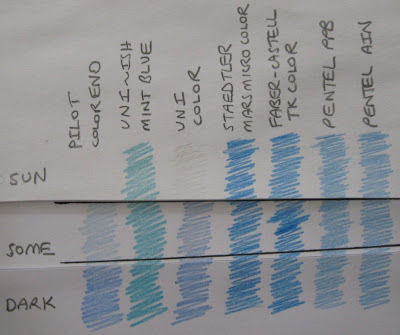 You will need to read my various blue lead postings to choose a lead for you that has the right combination of hue, lightfastness, strength, erasability, etc, but for me personally there is Pentel and then there is…nothing. No, NO, NO! Don’t ask me to repeat all this for red, green or any other blasted colour. It ain't happen'n. Office Max are big boys in the world of stationery, and if anyone should be able to get contract designers and manufacturers to produce a good product at a sharp price point then it should be them. 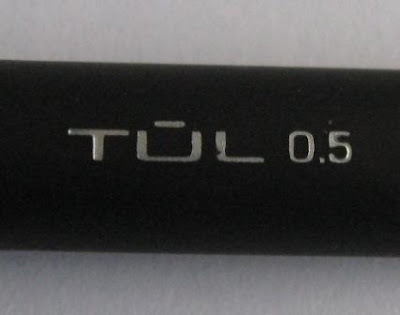 Obviously we should expect quite a lot from a TŪL brand writing instrument. Personally I quite like the TŪL brandname and its logo. It looks and sounds strong, foreign, efficient and tough. I believe you pronounce TŪL like “tool”, but I prefer to pronounce it like I imagine Ahh-nuld the Terminator would, “I’ll be back. I just have to get my TŪL”. 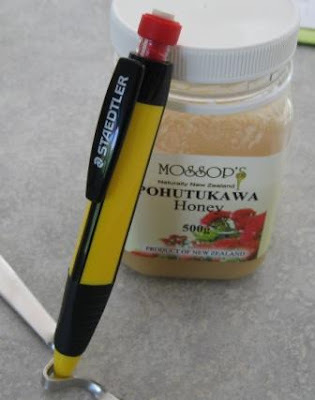 Taking the fun irreverent theme a step forward, you can go to the TŪL website to learn about their products and have graphologist Dr Gerard Ackerman analyse your personality via your writing style, and then suggest a pen for you. I don’t know, but I imagine that only pens are suggested, and the mechanical pencil isn’t in the running. Still, I took the test, and clearly Dr Ackerman is a genuine graphological expert, correctly categorising me as having “great inner strength”, and being both “efficient”, and “a wonderful lover”. Still, graphology is both a science and an art so and he wasn’t 100% correct, and I am still chewing on his pronunciations of me being “quick, callous, vindictive and vengeful”, and having “unfulfilled sexual expectations”. Hmm, younger readers please ask your parents for guidance. A big long plain matt black barrel, silver metal trims…plain but classic styling again reminding me of efficiency and reliability. The black insert at the end of the pocket clip and the interesting method of attachment of the clip to the body all show the influence of design. The TŪL logo is tastefully positioned on the body and the clip. Overall then I like the look of this pencil. 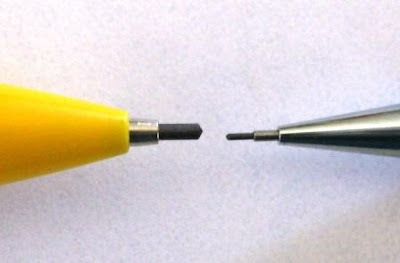 To my eyes, the only thing that lets the side down is the clear sections in the eraser cartridge which let the white of the eraser core be seen. Apart from the top end section the whole main body has a rubberised coating on it. This is one of those rubber coatings that I can accept. Sure, it’s not my favourite thing, but it’s plain, stylish, and actually improves the grip without being slimy or icky-squishy, or ribbed and contoured, or garish and bulbous. Another advantage is that you can grip the pencil anywhere you like as it’s all the same up the length of the body. 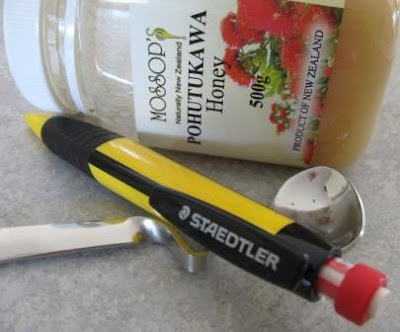 The pencil is fairly lightweight and feels neutrally balanced. The pocket clip is a piece of steel, lightly engraved with TŪL, and is attached to the body by an interesting moulded clip section. Down at the end of the pocket clip there is a black plastic insert to press against the body. The whole assembly looks good and works well; this is a pretty classy piece of design and manufacturing. Also up at the top end of the pencil there is a twist out eraser. As I said earlier, I don’t really like the look of the eraser cartridge, and the twist out mechanism on mine was a bit of a weak point. Many times the twist action was smooth and easy, but other times it was uneven, sometimes clicking or being hard to twist. 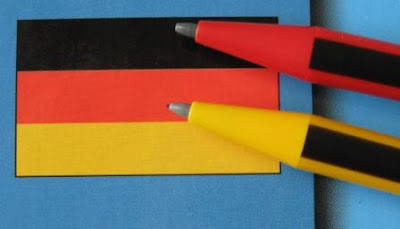 The eraser itself is a vinyl or PVC-free type and erases quite well. It is about 5mm diameter with 23mm of usable length. 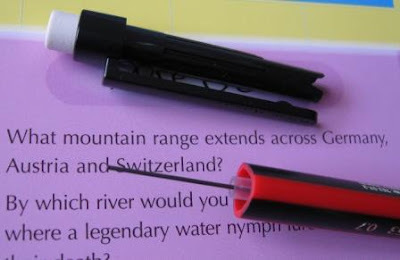 You pull the whole eraser cartridge out to access the lead magazine. The eraser cartridge is the push top button for the ratchet lead advance mechanism. Ten clicks will get you 8mm of the 0.5mm lead. I believe a 0.7mm lead option is also available. The mechanism feels nice and smooth to operate. The TŪL website says this is a semi-automatic lead advancement system. I'm not really sure what that means, and they don't explain it. The lead sleeve is a short cone suited for general writing. It is retractable for pocket safety. The lead has a lot of spring cushioning to help prevent breakage – you can really push it in and out a long way. There is a small amount of wobble of the lead sleeve within the front tip piece, but nothing out of the ordinary. So, you folk out there who live in the homeland of OfficeMax, ever seen any TŪL products out in the wild? Are they prominent within the OfficeMax stores? Best Points – The looks, the interesting pocket clip attachment and strange but true, the rubberised body. 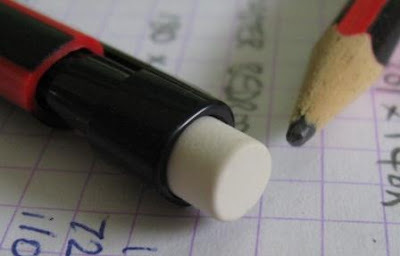 Not So Good Points – The twist out eraser cartridge. Does this pencil make it into the Top 5? – Worth a thought, but No. Dimensions – Length 152mm, diameter 10mm. Balance point about 65mm up from the tip. 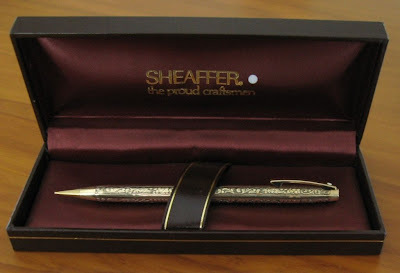 For some unknown reason I've never really been a fan of Sheaffer, but I’ve ended up with a couple of their pencils. Here’s one I picked up recently at auction. 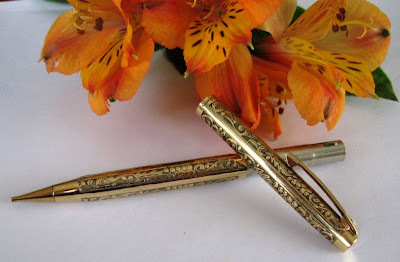 I’m not sure, but from some web searches I believe it is a Sheaffer Imperial pencil dating from the mid 1960’s to the mid 1970's. 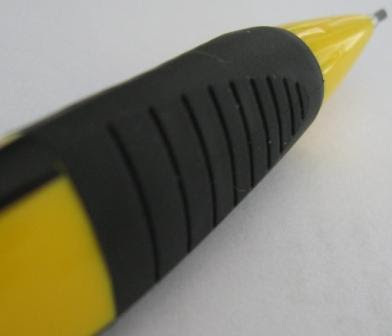 All photo’s are clickable to enlarge – I’d suggest you do so as this is a fine looking pencil. 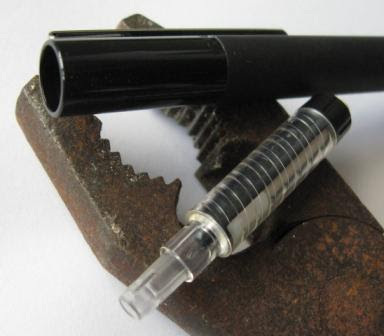 It uses 0.9mm lead, and is a screw mechanism. The top half of the body winds round and round to propel or retract the lead. Spare lead is stored inside the body, but it is a tip loading mechanism. 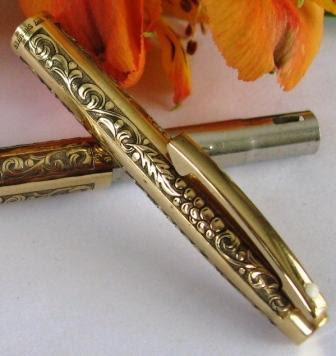 Around the centre it is marked “1/30 12K R.G.P CASING ‘crown’ SHEAFFER”. The ‘crown’ bit means there is a little crown logo there, which I assume is some reference to it being an Imperial. So, those markings mean the body is 12 carat rolled gold plate over base metal, the gold layer being 1/30th of the weight of the casing. The body is decorated with panels of quite deeply engraved floral type designs. I’m not usually a fan of that sort of thing, but it really is quite striking and attractive. 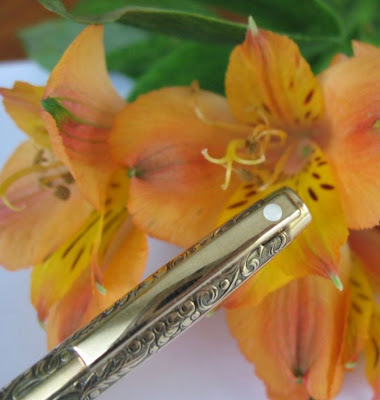 The pocket clip is spring loaded, and carries the Sheaffer White Dot. 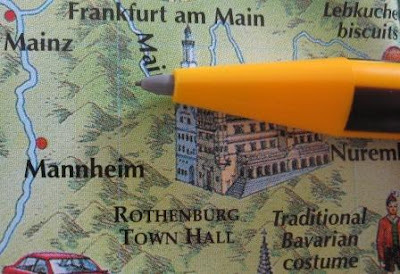 Large diameter and ergonomic style mechanical pencils for learner writers seem to be a popular theme these days, with manufacturers offering an increasing array of products. 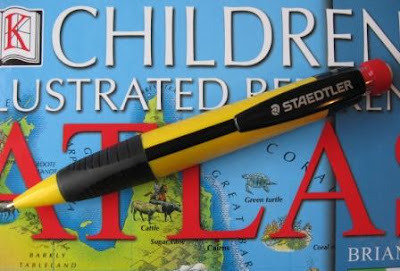 The Staedtler graphite 771 has been around for a while now, and is Staedtler’s main offering in this market segment, although they do not target it exclusively at children, noting it is also for those (adults) who like a larger chunky grip. 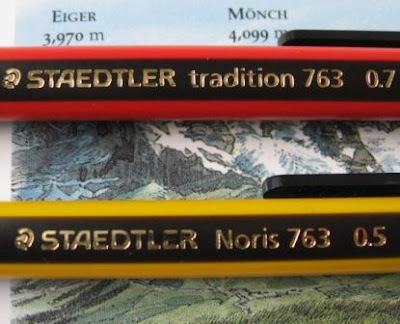 It is currently called the ‘graphite 771’ (that’s graphite with a lower case ‘g’) on the Staedtler website, but I feel sure that earlier on it was the Noris 771. Still, maybe I was dreaming. Noris is still mentioned in relation to the 771, as it is in the ‘Noris design’ which I take to mean the Noris yellow and black colour scheme. Despite being the sporting colours of an opposing province to mine, I’ve always had a soft spot for the Noris yellow and black scheme as it makes me think of industrious bees, and how much I enjoy the fruits of their labours. I imagine the bright yellow and black red-topped colour scheme would appeal to many younger users too. 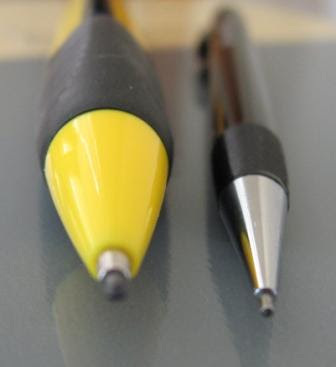 Being all-plastic, the 771 isn’t a heavy pencil, despite its size. The first thing I noticed about the 771 when I picked it up was the size of the grip. It is a triangular bodied pencil, and in the grip zone the sides of the triangle are about 15mm long. Now that’s big. To be honest, too big for me. Here are a few shots showing the 771 and a couple of average size Pentels. The grip itself is black rubber with grooves moulded into it. Its shape is tapering as it transitions from the triangular body down to the round tip section. The rubber compound is quite hard but does have some grip to it, so overall it does improve the grip. 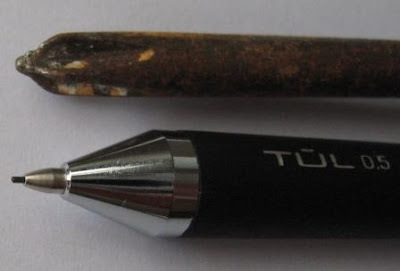 I personally found the grip tended to fit better in my fingers when the pencil was sloped down at a low angle to the paper, rather than a more upright stance. 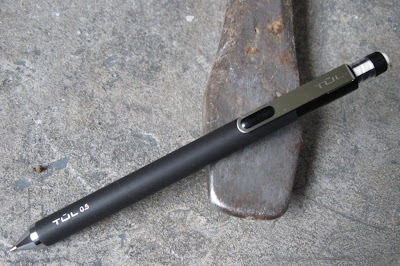 Of course holding it at a low angle accentuates the chisel point worn on the lead, and being triangular you have limited options for rotating the pencil in your grip. These are further limited by the large pocket clip getting in the way a bit. The pocket clip is plastic and reasonably functional, although it might not last that long at school. The large chucky body also meant it was generally too large for me to comfortably hold in my fingers whilst doing something else like punching a few keys on a calculator or keyboard. Of course, for children and learner writers my comments about the body size maybe irrelevant. 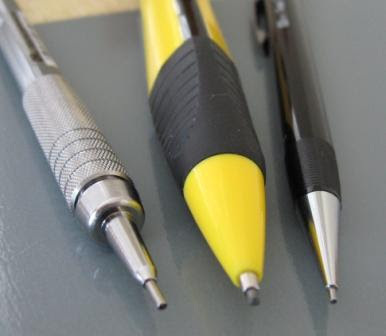 The 771 uses 1.3mm lead which is obviously tailored for the child writer - large enough diameter to give it plenty of strength, but thin enough so that it doesn’t need sharpening for their general writing purposes. 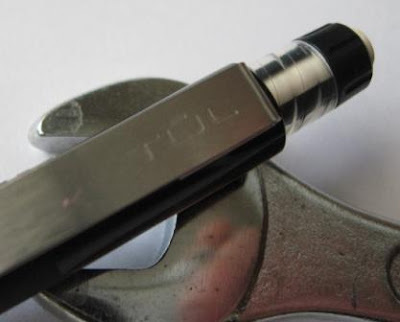 There is a small short metal lead sleeve, which is retractable for pocket safety. I quite liked the lead. Claimed as HB grade, it was nice and smooth and dark, and I would not have thought twice if it was claimed as B rather than HB. The lead advance is a standard push top ratchet mechanism. 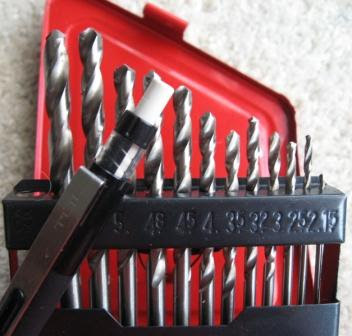 Ten clicks will get you about 8mm of lead. The mechanism has a good positive feel. 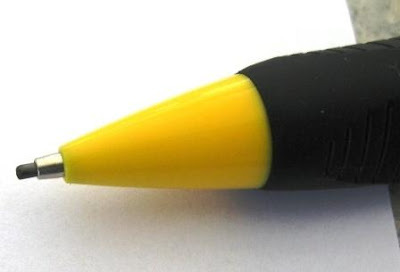 At the top end of the pencil is a large twist out eraser. The collar of the eraser cartridge is a red rubber compound and quite grippy, which is good. The eraser twists out and back in smoothly and easily. Mine certainly got a good workout in a few meetings – twisting the eraser in and out certainly helps time pass, and isn’t noisy. 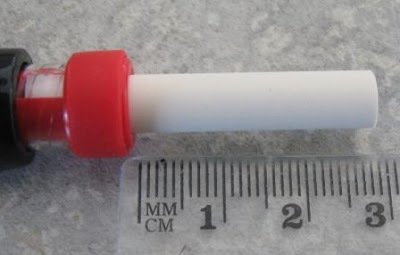 The eraser is about 7mm diameter with 28mm of useable length. It is a PVC-free compound and erases quite well. 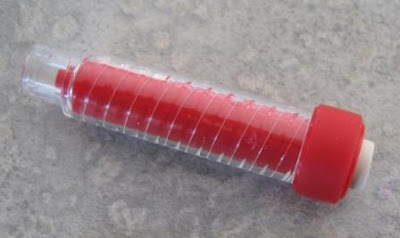 You pull the whole eraser cartridge out of the body to access the lead refill chamber. 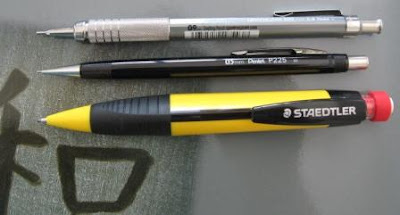 The only obvious markings on the pencil are the large Staedtler name and logo on the pocket clip. The stick on barcode and ID label includes the wording “Made in Japan”. Overall then, not a bad pencil, just not really one for me personally. Best Points – the twist out eraser. Not So Good Points – nothing I care to reiterate. Dimensions – Length 142mm, body sides 15mm. Balance point about 80mm up from the tip. Check out these new links over in the sidebar. From Korea, there is Ralrara. From Japan, Isu of The Uncomfortable Chair blog, now has a second blog, UC2. I’m not sure if UC2 is more or less uncomfortable, but its still UC so I guess Isu hasn’t gone and bought of those five thousand dollar recliners from Sweden that truly are heaven on earth. Finally, in Spanish we have Portaminas. Then back to English we have Alexa’s Mechanical Pencils. For those of you who like to follow comments on this blog, there is the Latest Comments section in the sidebar, but that only shows the last 5 comments. I have not had any luck at all adding any of the various other comment trackers to this blog – they keep crashing, or not showing, etc, etc. However, this is the link to the comment feed for this blog, so you can click on it, see the last few hundred comments, save the link in your browser Favourites, view comments at will, etc. How convenient! 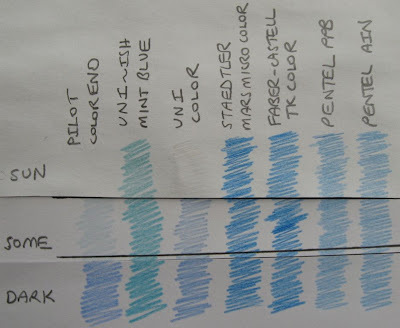 For those of you anxiously waiting, the blue lead fade testing is about halfway through. Some interesting results to date, but you’ll have to wait another few weeks yet. Lastly, house maintenance, travel and other non-pencilish things mean I will be a bit scarce over the next few weeks so posting will be infrequent and/or erratic.